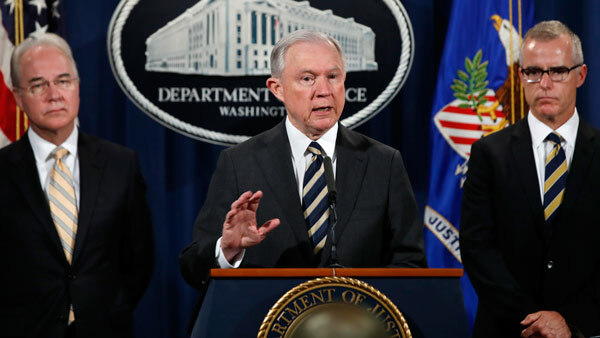 WASHINGTON -- U.S. prosecutors announced Thursday that they have charged more than 400 people with taking part in health care fraud and opioid scams that totaled $1.3 billion in false billing. Attorney General Jeff Sessions called the collective action the "largest health care fraud takedown operation in American history" and said it indicates that some doctors, nurses and pharmacists "have chosen to violate their oaths and put greed ahead of their patients." Among those charged are six Michigan doctors accused of a scheme to prescribe unnecessary opioids. A Florida rehab facility is alleged to have recruited addicts with gift cards and visits to strip clubs, leading to $58 million in false treatments and tests. Officials said those charged in the schemes include more than 120 people involved in prescribing and distributing narcotics. "They seem oblivious to the disastrous consequences of their greed. Their actions not only enrich themselves, often at the expense of taxpayers, but also feed addictions and cause addictions to start," Sessions said in prepared remarks. Sessions said in his remarks that nearly 300 health care providers are being suspended or banned from participating in federal health care programs. The Justice Department said the people charged were illegally billing Medicare, Medicaid, and the health insurance program that serves members of the armed forces, retired service members and their families. The allegations include claims that those charged billed the programs for unnecessary drugs that were never purchased or never given to the patients.